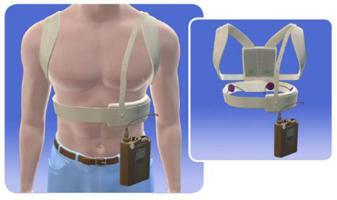 The U.S. Food and Drug Administration approved a new indication for the LifeVest wearable cardioverter defibrillator. The LifeVest is approved for certain children who are at risk for sudden cardic arrest, but are not candidates for an implantble defibrillator due to certain medical conditions or lack of parental consent. While manyautomated external defibrillators (which require a second person to operate them) have been cleared for use in children, LifeVest is the only one worn by the patient and monitors the heart continuously for abnormal, life-threatening heart rhythms(arrhythmias) . LifeVest responds automatically if it senses the need to deliver a shock, restoring a life-sustaining heartbeat. A life-threatening abnormal heart rhythm, referred to as ventricular fibrillation (V-fib) or ventricular tachycardia (V-tach), is the most common cause of sudden cardiac arrest, according to the National Heart, Lung and Blood Institute. Certain diseases and conditions that can lead to sudden cardiac arrest include heart disease, certain inherited disorders and structural changes in the heart (such as those due to infection or congenital heart disease). Most people who have sudden cardiac arrest will die from it, often within minutes. Rapid treatment with a defibrillator can save lives. Weighing less than two pounds, the device consists of two main components: an electrode belt and garment that surround the patient’s chest, and a monitor that the patient wears around his or her waist. This device is intended only for children that weigh at least 41 pounds and have a chest size of 26 inches or more, about the size of an average 8 year old. The device was first approved in 2001 for patients 18 years of age and older. Later models of the device were approved for patients 18 years of age and older in 2002, 2006 and 2009. Today’s pediatric approval was based on published studies and a company registery containing clinical information from 248 patients, ages 3 to 17, at risk for sudden cardiac arrest. No additional safety concerns were identified, and four patients who experienced sudden cardiac arrest received a shock that successfully restored a life-sustaining heartbeat. The LifeVest defibrillator is manufactured by the ZOLL Manufacturing Corporation based in Pittsburgh, Pennsylvania.